If you are driving south from Medford, Oregon, you will reach Hwy. 96, or the Klamath River Hwy. turnoff about 45 miles south of Medford. The turnoff will be to the west, or to your right. Happy camp is approximately 68 miles west on this highway. It is a beautiful drive, getting progressively more green and forested as you travel west. Take your time and enjoy it. If you are driving north on Interstate 5 from Yreka: approximately 11 miles north of Yreka you will see the turnoff to Hwy. 96, or the Klamath River Hwy. Take this turnoff and drive west approx. 68 miles to Happy Camp; enjoy the scenery. As you drive into town from the east (I-5), look for Davis Rd., turn to your right and The New 49’er Headquarters will be on the right just a few buildings down. If you are driving from the coast, just look for Davis Rd and turn left. Nearest airports are in Redding, California and in Medford, Oregon. Only round trip rental cars are available at both airports. There is a paved runway in Happy Camp for those who wish to fly in using private aircraft. 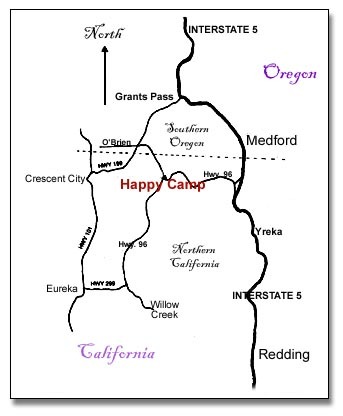 Happy Camp has several motels, and reservations are recommended. 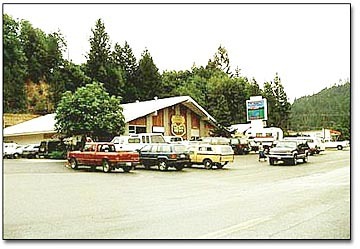 Klamath Inn Motel, 530-493-2860; Forest Lodge Motel, 530-493-5425; Angler’s Motel, 530-493-2735; Bear Cove Cabins, 530-493-2677; Thompson Creek Lodge, 530-496-3657. Reservations recommended, and Elk Creek Campground has limited furnished trailers for rental during summer, also has approved sewer dump station for RVs. 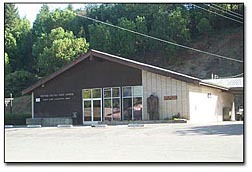 Klamath Inn RV Park 530-493-5377; Elk Creek Campground, 530-493-2208.